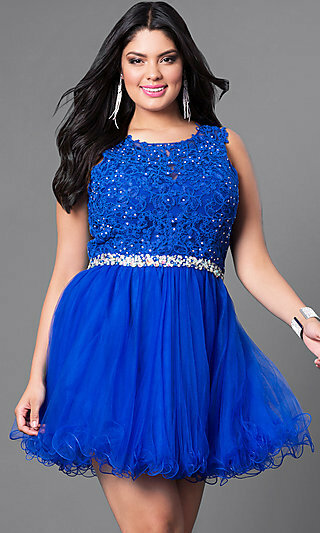 PromGirl has the picture-perfect plus-size party dress for you. Our plus party dresses come in a spectacular range of styles and colors that range from must-have black party dresses to glamour-infused red plus cocktail dresses for a breathtaking look. There is a selection of figure-flattering plus-size party dresses so you can celebrate knowing you are looking your best. The latest styles of short v-neck party dresses, sleeveless bodycon plus dresses and short celebrity-inspired plus-size dresses for parties will give you the edge on fashion. The large variety of plus dress designs at PromGirl provides many options for you to choose from. Step up your trendy style at your next party with an outstanding short lace dress or a richly embellished PromGirl plus party dress. You will find ultra-feminine plus-size lace dresses, vibrant print cocktail dresses and jewel-embellished beaded short plus-size dresses fashioned right for wedding receptions and special-occasion parties. Wear a plus-size party dress from PromGirl for a stylish look at your next special occasion. Your perfect plus-size party dress is here at PromGirl where you will find a great selection of party dresses in a dazzling array of colors, styles and designs. If you are looking for a plus-size short black party dress that works beautifully for any event or a cocktail dress in navy blue for a unique look you will find it here. We have pretty pink semi-formal party dresses and fiery-red short plus dresses to show some sass on the dance floor. PromGirl has plus party dresses in every color under the rainbow and in a variety of styles. Our short a-line plus-size designer dresses are elegant and trendy. We have plus-size dresses with sleeves for stylish comfort at formal celebrations. 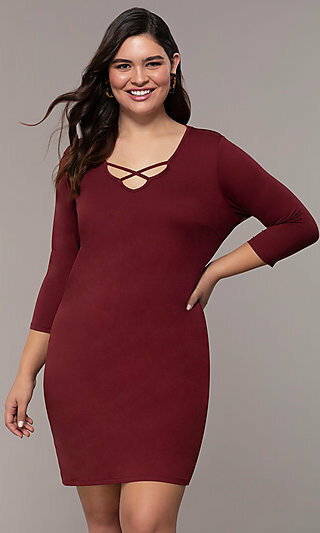 You'll find v-neck party dresses with three quarter sleeves or black cocktail dresses with long sleeves. Give yourself a fashion forward look with a stylish twist and choose an off-the-shoulder plus dress with sleeves from PromGirl where you are sure to find a unique plus dress fashioned just right for you. Plus-size party dresses at PromGirl are available in a variety of designs so you can stand out from the crowd at your next celebration. This collection of plus print dresses can’t be beat. You will love the plus-size short wrap print party dresses and floral-print a-line cocktail dresses that are stylish and unique. Bring on the glam in a short beaded plus party dress or jewel-embellished fit-and-flare dress for a festive celebration. At PromGirl, we have trendy lace-bodice babydoll dresses that ensure a breathtaking look for any special event. From semi-formal plus-size party dresses to glamorous short plus cocktail dresses, PromGirl has the party dress that's sure to get you noticed.